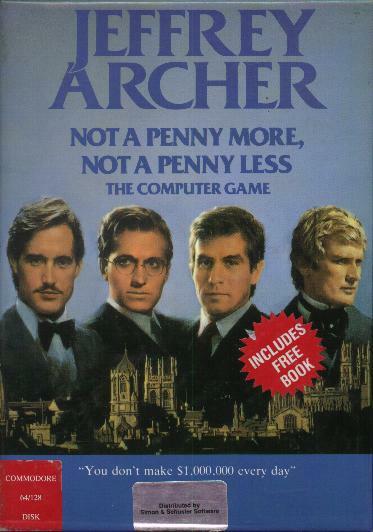 One of many mid-1980s attempts by bestselling fiction authors to license computer game adaptions of their work. (Witness Epyx's The Robots of Dawn, much of the Angelsoft/Mindscape library, and the entire Telarium lineup.) Everyone wanted to be the next Hitchhiker's Guide. Based on the first published novel by Jeffery Archer, NaPM,NaPL is text with graphics, and centers around four investors who try to steal back $1 million from the stock-fraud con man whose phony company swindled them out of it. Supposedly it follows the plot of the book closely, though I haven't read it myself, and in fact the game includes a paperback copy. The Atari ST version features speech synthesis. Fellow collector Dave Aston informs me that Mr Archer (or Lord Archer as he eventually became) is currently serving a four-year sentence in Her Majesty's Prison Belmarsh for perjury.